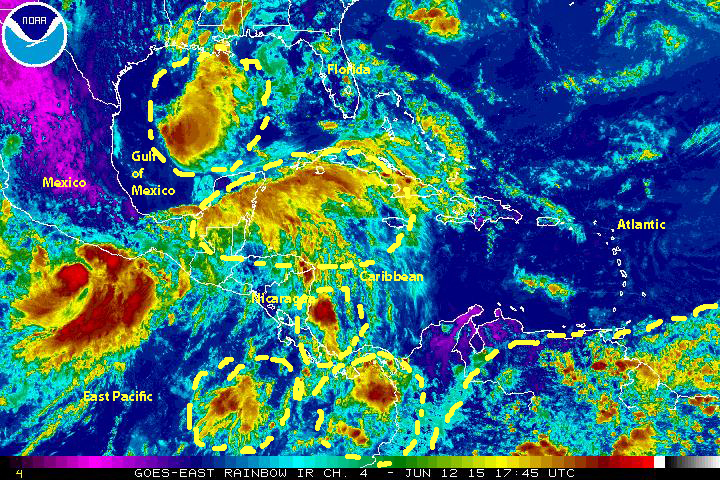 June 12, 2015: It is Carlos, the Caribbean, the Gulf, and floods in Nicaragua! There is plenty of disturbed weather near our neck-of-the woods here if our Florida paradise! Today, Friday 12 June 2015, marks the first four weeks of the ‘official’ 2015 East Pacific Hurricane Season, which is off to a fast start with three named storm already. The latest of these storms, Tropical Storm CARLOS is almost stationary some 200 kilometers southwest of Acapulco, Mexico over an area of warm surface waters and a favorable ocean-atmosphere environment that may lead to further strengthening of this tropical cyclone. Opposite T.S. Carlos off the eastern coast of the state of Quintana Roo, Mexico on the Yucatan peninsula, there is an area of low pressure and an active cell of stormy weather over the northwestern Caribbean. Just to the north of that disturbance, over the central Gulf of Mexico, there is a large ‘glob’ of stormy weather that is already generating copious rain over a wide area. 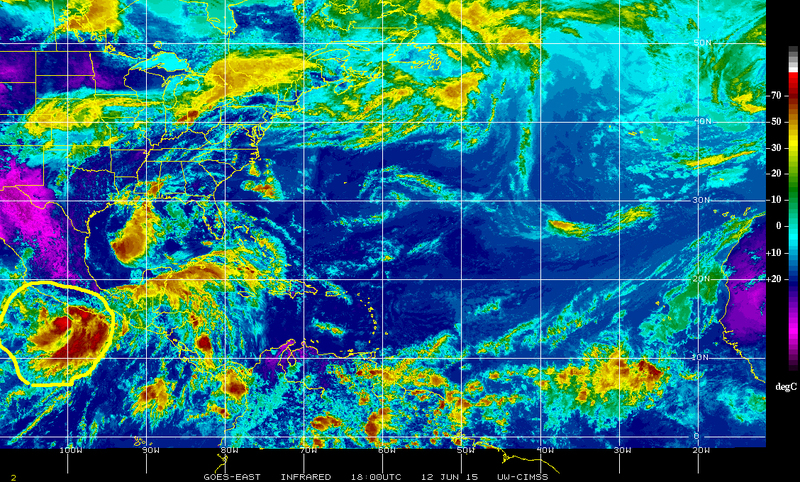 Looking south, over Central America, the off-shore waters of the Eastern Pacific, the central Caribbean, and the northern regions of South America over Colombia, Venezuela and Guyana, there are plenty of systems that have prevailed for some time now, fueling rainy and stormy weather over a large area. The aggregation of all of these elements of weather has already had adverse consequences over the region extending from central/southern Mexico, through Central America and Panama, to northern South America. This prevailing and current weather pattern over this region [Caribbean and Gulf activity], which is really a continuation, a repeat if you will, of what we have seen in recent years and most especially in 2014 when the East Pacific hurricane season generated 20 named tropical cyclones, surpassing the 18 generated in 2013, has had particularly damaging consequences in Nicaragua where extreme rain events over most of the country including over Managua, the capital city, where more than 200 mm of rain fell there yesterday over a period of 6 hours, leading to numerous instances of flash floods, some death by drowning, and extensive damage to homes and infrastructure. Emergency management authorities have declared an emergency and have evacuated hundreds of families in Managua and in other communities. There is no question, but that all interests in the region will need to watch unfolding events closely, but as El Niño continues to develop off the Pacific coast of Peru and Ecuador prevailing wind currents are causing tropical waves along ‘Hurricane Alley’ to traverse over northern South America and Panama into the Eastern Pacific where they are fueling the kinds of disturbed weather we have seen over the past few weeks, and potentially future cyclonic activity as well. 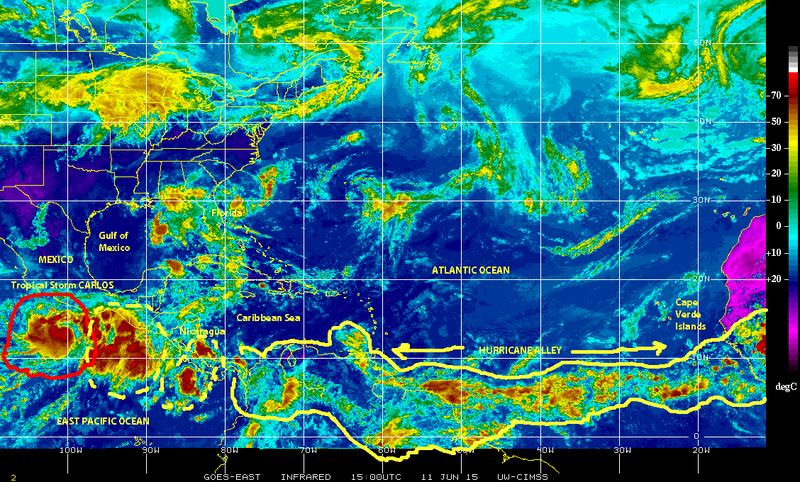 It is clear that there may be plenty of this kind of activity in the northern tropics over coming months, consequently all interests in Nicaragua, or Mexico, or in the rest of Central America, and in the Caribbean and especially here in Florida must remain alert, be prepared and continue to mitigate! The storm system we have been monitoring in the Eastern Pacific, off the coast of Central America and Southern Mexico, strengthened earlier today (11 June 2015) to become Tropical Storm CARLOS the 3rd named tropical cyclone of the 2015 East Pacific hurricane season. The storm was located some 200 km to the south of Acapulco, Mexico and is expected to move parallel to the coastline toward the NNW for the next 24 – 48 hours. All interests along the Pacific coastal region of Mexico from Acapulco to Mazatlan and Cabo San Lucas should brace for heavy rains, storm surge and bad weather, and monitor the progress of Carlos closely. Following in the wake of Tropical Storm Carlos there is a large cell of stormy weather off the coast of Central America, which is being fed by a train of tropical waves and storm cells moving westward along ‘hurricane alley’ and extending to the eastern Atlantic and Equatorial Africa. These are the seeds that may fuel additional stormy weather in the Eastern Pacific sub-basin in days to come. Concurrently with T.S. Carlos some 17,000 km to the east in the Arabian Sea Tropical Storm ASHOBAA is 200 km east of the coast of central Oman, where it is projected to make landfall some time tomorrow 12 June 2015. Future tropical cyclone activity should be expected over the warm waters of the oceans in our Earth’s northern hemisphere. 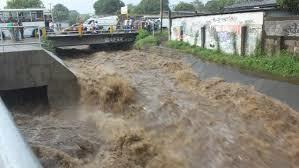 Let us remain alert, be prepared and always practice mitigation!